No cell service, gourmet meals, sunny days, cool nights and a cabin to myself—just a few of the ingredients that created a perfect retreat. I spent a week in Boyd Mills, Pennsylvania at a writers’ retreat sponsored by the Highlights Foundation. Terminally sleep deprived, I caught up on sleep. Sleep is good…but the real gift for me was the time to just be. The first two days I wrote furiously, after that I wrote, napped, walked in the woods, waded in the creek, and edited my writing. If you don’t have the luxury to escape from the demands of everyday life for a week, try creating a personal retreat for a day or even just an afternoon. You don’t need to include all of the suggestions below. Just pick one and try to incorporate it into a personal stay at home mini retreat. Here are some of the elements that I think create a successful retreat. R– REST AND RECHARGE YOUR BATTERIES. I can’t remember when someone in my house didn’t wake me up at night. My eldest son is 23 years old, and I am sure that I have not slept through even one night in the last 23 years until this retreat. If it’s not my kids or husband roaming around the house waking me up, it’s our dog. E – EAT WELL. If you want to jump-start your life, besides rest you need nutritious satisfying food. The meals provided by master chef Marcia Dunsmore nourished my body and spirit. T – TAKE TIME to do something you love or just do nothing at all. Set your intention for the retreat and then give yourself the time to do it. I had a two-fold intention—to work on two of my manuscripts and to re-energize my spirit. R – Reflect. Spend some time reflecting on your life. What brings you joy? What are you struggling with? What doesn’t support you? These questions are easiest to answer away from ones everyday routine. E – ENGAGE YOUR SENSES. Find a peaceful setting that engages your senses. 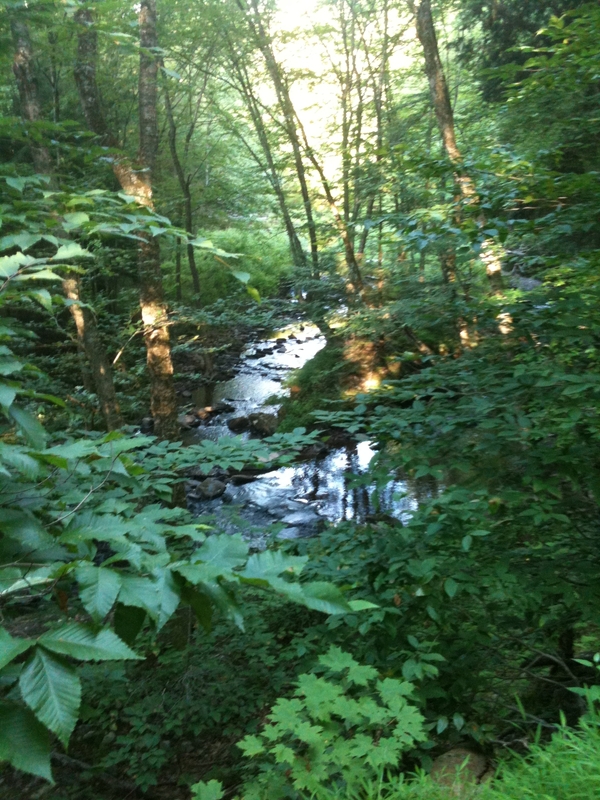 I spent the week nestled in the forested hills of Pennsylvania along a rolling creek. If you are planning to try a stay at home retreat, de-clutter and clean the space and surround yourself with things you love. Use flowers, a scented candle, dark chocolate or whatever else evokes tranquility and arouses your senses. A – ALLOW TIME FOR PLAY. My retreat was a writer’s retreat, but I knew it was important to allow time for play. Laughter and play fuels my creativity. I couldn’t resist rolling down the hill or swinging in the tree swing. T – TRY SOMETHING NEW. I don’t write in rhyme, but I tried it on the retreat. Although I wasn’t thrilled with the results, it triggered some new ideas. Step out of your comfort zone and magic can happen. This week: Make a plan to have a mini-retreat this fall. This entry was posted in create the life you want, Spirit, stress reduction and tagged Create, Eckhart Tolle, Highlights, Marcia Dunsmore, retreat. Bookmark the permalink. In the summer I get up early once a month and go down to the lake an watch the sunrise. Then I walk along the beach and head home. 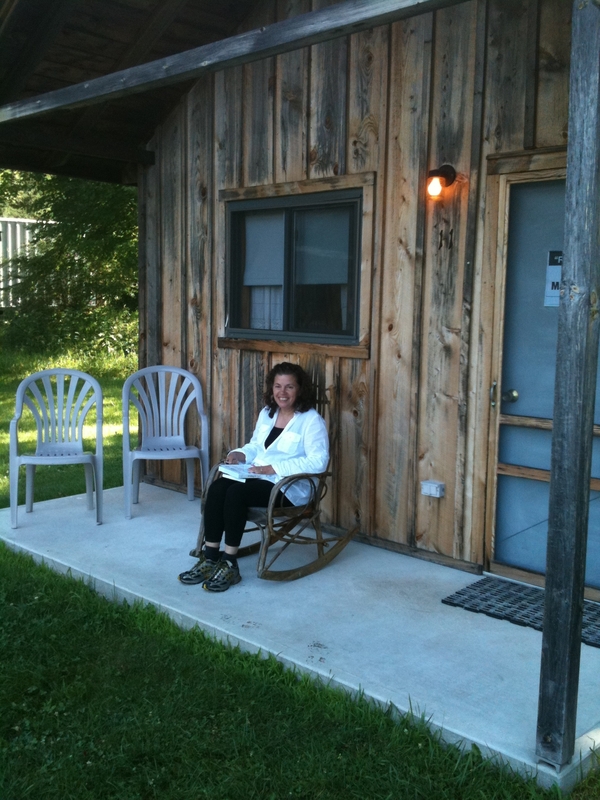 The “Room to Create” retreat was one of the best gifts I ever gave myself as a writer. A day of writing, napping, walking in the woods, wading in a creek, and editing writing…sounds heavenly! I relaxed just reading your entry. Long walks are my mini retreats, especially when I walk alone. Walking alone almost always leads me to an almost breathtaking awareness of God’s presence. So why, I am asking myself, do I wire myself to the max? Cell phone on my belt, podcast/book in my ear, pedometer in my pocket. Sheesh. You got me thinking over her, Mary Jo and for that I thank you, friend. Thanks for all the comments and congratulations to Paula! Your are the winner of Cheryl Richardson’s book “The Art of Extreme Self Care.” Please email your address to me at info@donorth.biz and I will send it to you. Thanks, Mary Jo! Sorry I didn’t get back to you sooner … been a crazy summer. Oops, that posted before was done. Meant to add that I’m looking forward to reading the book … thank you for making it available!